Mayo is endowed with a rich stained glass heritage. Fine examples of the art can be found in buildings, mainly churches, throughout the county. 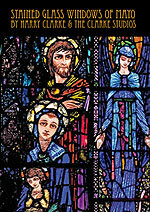 Among these works are outstanding examples of stained glass windows by Harry Clarke (1889–1931), one of Ireland’s most famous stained glass artists. Throughout the county also are fine examples of windows from his father’s studios, Joshua Clarke & Sons, and from the Harry Clarke Stained Glass Studios Ltd., which continued from 1930 to 1973. Windows by a number of other renowned stained glass artists can be found in the county also, including Sarah Purser, the founder of the Irish stained glass studio, “An Tur Gloine” (The Tower of Glass), Michael Healy, Richard King, A.E. Child, Wilhelmina Geddes, Hubert McGoldrick and Patrick Pye. This website, compiled by the Heritage Office of Mayo County Council, gives details of the artists whose windows can be found in Mayo, along with a list of their works and where in the country they are located. A booklet on the Harry Clarke & Clarke Studios Stained Glass Windows in Mayo is available from the Heritage Office of Mayo County Council, cost €6 + €1 p&p. Harry Clarke Stained Glass Studios Ltd.